Mind Yoga is a term Annette Quarrier coined when she decided to host a podcast which helps people realize the power they give away when they let their thoughts get the best of them. 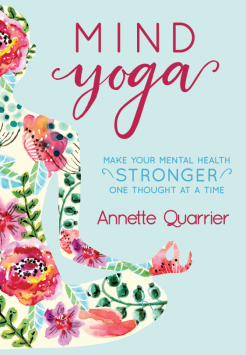 Her podcast, Mind Yoga Quick Quotes with AnnetteQ, encourages listeners to stretch their minds and think about the quote as they go about their week. This book is a compilation of the quotes and topics from the first year of her podcast with additional insight and mind stretching exercises. Physical exercise is common in our society, yet we rarely spend time improving our mental health. By learning that the power to our happiness starts with each thought we think, we can begin to have more peace in our lives. Annette Quarrier is a Certified Life Coach whose passion is helping others practice to develop a healthier mindset. She can be reached at annetteq.com and she posts a daily quote on Facebook, Instagram and Twitter at Mind Yoga with AnnetteQ.